Get a closer look at the amazingly beautiful rock formations that made Wisconsin Dells famous. 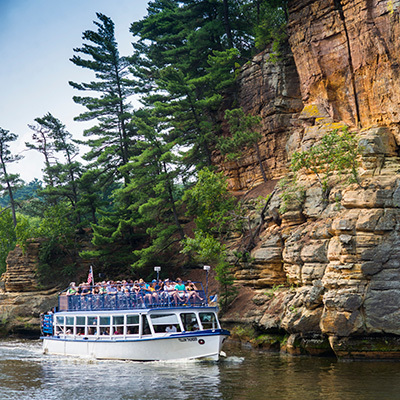 While on the Upper Dells Boat Tour in Wisconsin Dells, you will embark on a two-hour cruise up the Wisconsin River floats, past towering sandstone cliffs cut by glaciers ages ago. This is the only Dells boat tour that makes two different stops – walk through mysterious passageways at Witches Gulch, and marvel at our specially trained dogs as they leap across the chasm at Stand Rock! Please call 608-254-8555 for departure times. All tours based on weather and water permitting.